News from LMCU: LMCU’s Hutt Scholarship is off and running! LMCU’s Hutt Scholarship is off and running! If your senior can answer this question with passion and creativity in a 750-1,500 word essay, one of eight $2,000 scholarships could be theirs. Essays are judged on content, passion and flair first, and mechanics second. 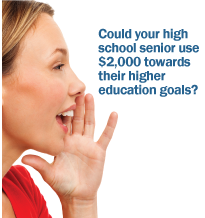 Scholarship money can be used for most any legitimate post-high school educational endeavor. Enter today at LMCU.org/Hutt or by picking up an application at any LMCU branch or at your school's Guidance Office. Entries must be received by January 31, 2014.